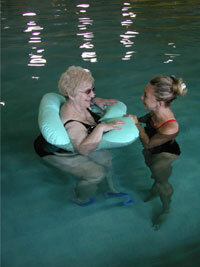 Aquatic physical therapy is defined as physical exercises in a swimming pool. Designed to help patients regain freedom of movement, it can dramatically reduce, and even eliminate pain. The combination of simple exercises and heated pool water has a safe, therapeutic effect on the body, in many ways unmatched by other means. The natural buoyancy of water offers support for the body by diminishing the effects of gravity. As a result, it reduces stress on joints and muscles, while providing moderate compression for improved circulation to promote healing and improved muscle tone. Patients with neck and back pain, including most sports-related injuries, often benefit from aquatic therapy as well as those experiencing severe weakness as a result of injury or surgery. Additionally, the pool’s heat helps soothe the pain associated with injuries or discomforts. Patients recovering from muscular or skeletal injuries can control the intensity of their therapy by increasing or decreasing the amount of water resistance while performing their aquatic exercises. Often the physical therapist will recommend weights and flotation devices to help speed recuperation. Kick boards, tube floatations and “noodles” are frequently used. At each of Bethesda’s facilities, programs are tailored to the individual's needs by a licensed physical therapist trained in aquatic physical therapy. Gradually, the aquatic exercises move to a land-based program to assure complete recovery. Aquatic Therapy is offered at the DeVos-Blum Family YMCA of Boynton Beach and the Blum Family YMCA of Boca Raton.